People who walk or cycle for transport tend to be slimmer than those who rely on a car to get around, according to a new study of 15 countries. The study looked at the relationship between "active travel" — bicycling or walking instead of driving — and physical activity, obesity and Type 2 diabetes. More than half of the differences in obesity rates among countries was linked to walking and cycling rates, Prof. David Bassett Jr. of the department of kinesiology, recreation and sport studies at the University of Tennessee, Knoxville, and his colleagues report in the American Journal of Public Health. "Our results suggest statistically significant relationships — in the expected direction — between walking, cycling and health at the country, state and city levels," the study's authors concluded. 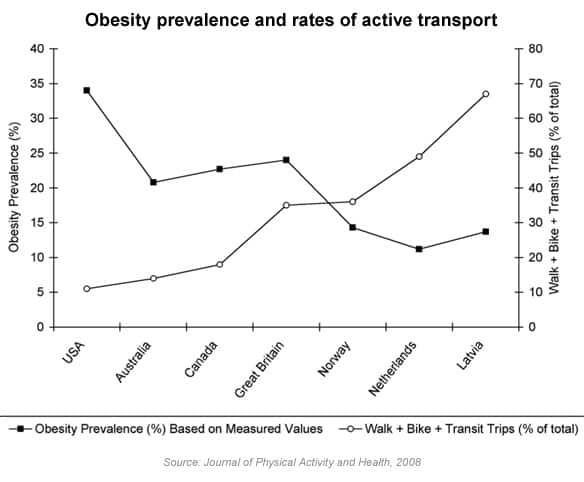 "Among the 14 countries in our international comparison, those with higher levels of walking and cycling tended to have lower levels of adult obesity, whether self-reported or clinically measured." In Europe, about half the trips people made — for whatever purpose — were on foot or bike compared with eight per cent in Canada and 10 per cent in the U.S., the researchers found. "Not surprisingly, the European countries had obesity rates that were half [those] in North America," Bassett said. The findings do not prove that walking and cycling lower obesity but support the hypothesis that active travel encourages more physical activity and leads to lower rates of obesity and diabetes, the researchers said, particularly when considered as part of the mounting body of evidence on the health benefits of active travel. European countries with high rates of walking and cycling have far less obesity than Australia, Canada and the U.S. that are more dependent on cars, the researchers noted. Provide safe, convenient and attractive sidewalks, crosswalks, bike paths and lanes. Modify intersections to protect pedestrians and cyclists. Restrict car use with approaches such as car-free zones, traffic calming in residential neighbourhoods, speed limits, and limited and more expensive car parking. Foster compact, mixed-use developments that generate shorter trip distances that are easier to cover by walking and cycling. An earlier study by Canadian researcher Prof. Lawrence Frank found that for each additional hour in a car, there was a six per cent increase in likelihood of obesity, which he said was because of the time spent sitting in the vehicle instead of being physically active. The work proves that transportation decisions are also health decisions, said Frank, Bombardier transportation chair at the University of British Columbia in Vancouver. "The argument we're making is to let's bring the health-care costs into the transportation decision-making arena because those costs are real, they're measurable and they're huge," Frank said. Research also showed that by walking and cycling instead of driving, Europeans burned up to nine pounds of fat a year. An earlier study by the researchers concluded that despite the colder climate, Canadians cycle about three times more than Americans. 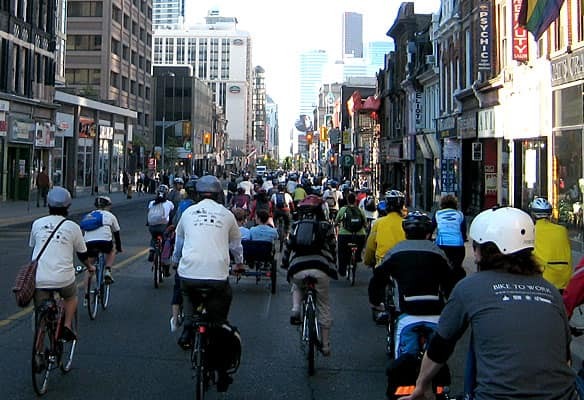 The difference was attributed to Canada's higher urban densities and mixed-use development; shorter trip distances; lower incomes; higher costs of owning, driving and parking a car; safer cycling conditions; and more extensive cycling infrastructure and training programs. Still, Canadian cities can do a lot more to improve cycling conditions, said Suzanne Lareau of the Montreal-based cycling group Vélo Québec. "We have to reduce the vehicle traffic in town because the worst enemy for the cyclist and pedestrian [is] too heavy traffic," Lareau said. Over a year ago, Sheena Hyndman of Toronto started riding her bike everywhere. She's lost 40 pounds that she says is mainly thanks to changing how she gets around. "I've lost a lot of weight, first of all, but that aside, just my mental well-being," Hyndman said. "I feel a lot healthier and happier in general, and I think people notice that about me."